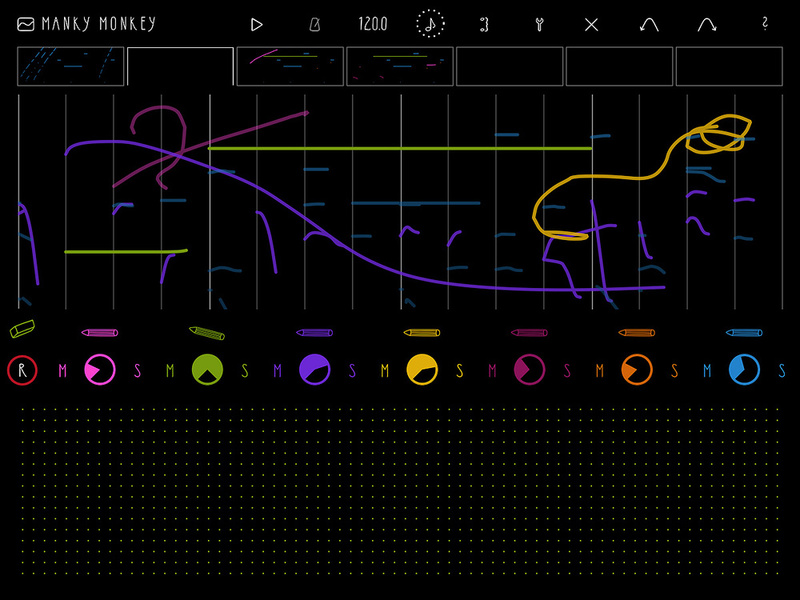 Squiggles turned into music — Fluxpad provides a colourful overview of every note pitch and duration. It’s getting harder and harder to produce an iOS sequencer with enough personality to stand out from the crowd, but it’s just possible Fluxpad is such an app. Instead of conventional note input, you use the iPad’s touchscreen to draw music directly. In this sample-based sequencer, the Y axis represents pitch and the X axis duration, or sustain. It’s all very fluid and natural, although the results often resemble the doodles of chimps let loose with paint and paper. Fortunately, music isn’t about looks — or shouldn’t be — and the process of wiggling your finger to make beats, bass lines and melodies is delightfully intuitive. The main screen is divided into the free-form arrange window or Drawing Board, with each part’s input identified by colour. Everything is based around four-bar patterns and each project has a maximum of seven of these placed along the top row. Patterns may be selected for tweaking and performance or copied and pasted as required. Below the Drawing Board are the level controls for the seven instruments and their adjacent mute/solo buttons. This leaves a ‘live play’ area filling the lower portion of the screen. All but one of the available instruments is described as ‘melodic’ and the play area of the very last (drums) is noticeably different — it’s divided into the seven voices available to a drum kit. As with the Drawing Board, the higher up you tap, the higher the pitch. If you’re inspired to start recording right away, you can click the R icon, enable the metronome and create your first groove. It’s not entirely without latency issues though, at least the response didn’t feel particularly snappy or consistent on my iPad Air. Fortunately, this improved when I adjusted the audio buffer size from its default of 512 down to the minimum of 128 (no units are given), but annoyingly this value is reset to 512 every time Fluxpad starts up. The only other screen is used to select or record samples and adjust their level, envelope and pan. You can specify the note input range via a small pop-up keyboard and confine your playing to either major or minor scales. Since notes are pitched vertically across the play area, it’s not very precise and I found it weird that the longer horizontal plane wasn’t used instead, especially as there’s no control given over note velocity. Fortunately, there’s an alternate method of inputting notes, one that’s far more satisfying: you can draw directly on to the Drawing Board. Turning coloured squiggles into notes is a joy and when you draw from right to left, the sample is played backwards. However, other than quantisation (pre- or post-recording), there are no editing tools to fix mistakes. This isn’t a massive drawback because it’s easy to undo or erase what you’ve done and simply repeat. If you sketch in a large pitch sweep over several bars, your finger movement is captured in all its wavery glory — even percussion hits are subject to pitch bends. Approximately 100MB of samples are supplied, some created by Mouse On Mars and all of useable quality. Changing the sample used by each channel is accomplished by a long touch of any pencil icon or volume knob. The Sampler Settings window then opens to reveal a selection of contemporary synth, voice and percussion samples. It’s just as well these are rather good since only minimal processing is offered. Each may be panned, truncated or shaped by a simple envelope then set for either one-shot or looping playback. For each hit, the sample is either restarted from the beginning or from a random position. 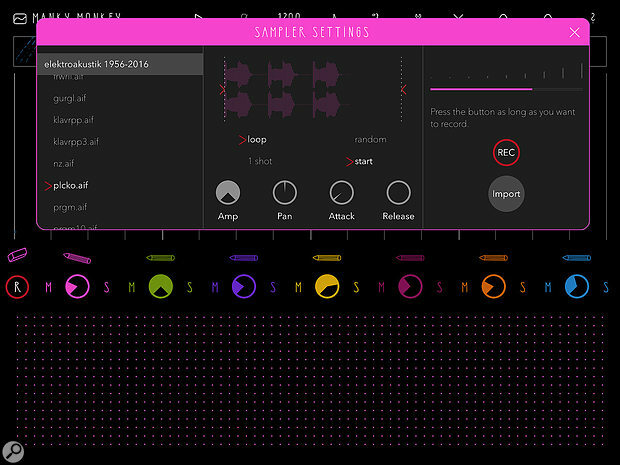 The small pop-up window still manages to accommodate a built-in sampler — a very basic implementation with just a level meter and record button. In the event, it’s serviceable enough for adding your own material to the mix, and external samples can always be introduced via Audioshare or the usual iTunes file-sharing. If you’d rather just buy extra sound packs, MoMinstruments are happy to oblige, and at 79p99c each, they won’t break the bank. Finally, to polish any of your ideas into finished tunes, an export process is included, but at the moment it doesn’t create a mixdown format other apps will recognise, making it of minimal value. There isn’t much left to tell. 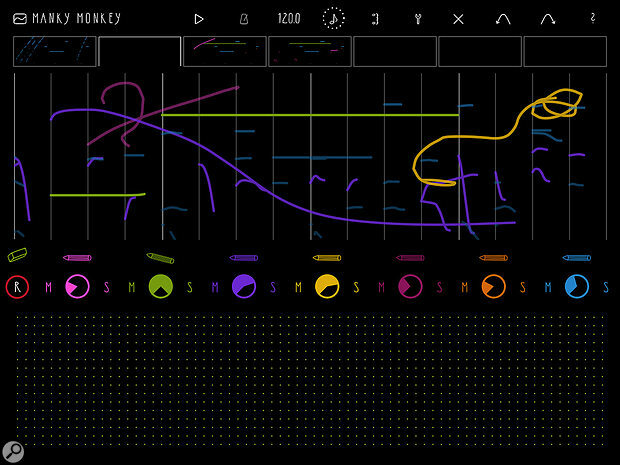 Audiobus, Ableton Link and MIDI sync are supported but Fluxpad is probably best viewed as a stand-alone interactive sketchpad or a tool for (basic) live performance. It doesn’t feature a song arranger and you’re assumed not to mind working exclusively on four-bar patterns without effects, dynamics, automation or anything else that would obstruct the fast, simple and ever-so-slightly different interface.